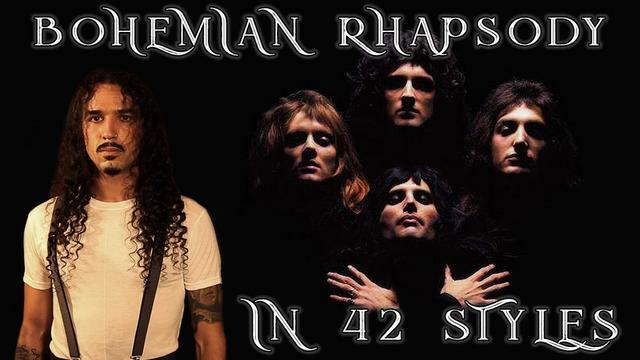 Anthony Vincent of Ten Second Songs has released his newest video, QUEEN's "Bohemian Rhapsody" in 42 Styles, including such diverse artists and bands as SYSTEM OF A DOWN, Frank Sinatra, Scott Joplin, and Bobby McFerrin. "I disappeared from the internet for a month to finally take on my number 1 requested song. Being away from social media was very good for me an I highly recommend this to anybody. Maybe everyone should start producing songs in multiple styles just so they too could take a vacation from social media. Also, I want to thank E Rock of course for hopping on to make the Dream Theater part possible, because I can't shred on guitar. But i can shred on the bass! Who knew!